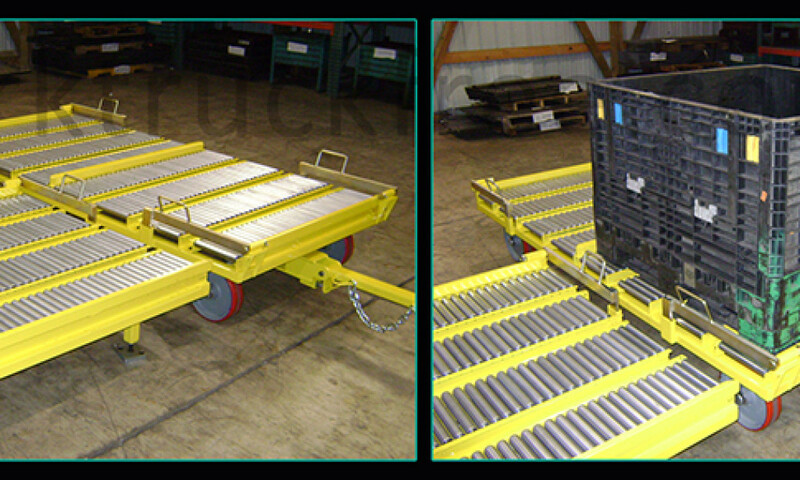 Conveyors on wheels – Topper Industrial Transfer Carts are a part of a conveyor/cart material handling system. The transfer cart is an industrial cart equipped with a conveyor roller top. The rollers aid in the transport of specific content in a conveyor like manner. The carts are tugged or push into transfer position. The transfer cart will be lined up to the corresponding conveyor table or system so that the rollers line up. The contents being transferred, for instance a container or pallet of product is released to the conveyor line or system. The content can be released manually or pneumatically. Please check out some examples of Topper’s industrial transfer carts here. *Most products are patent pending.